Mary Jewell has been a member of the SDSO viola section since 1990 when the Jewell family moved to Sioux Falls from Oak Park, Illinois. 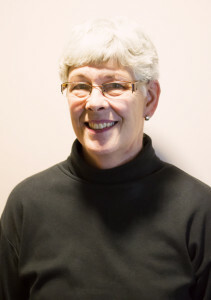 She also taught strings and directed orchestras at several Sioux Falls schools prior to her retirement in 2003 after 35 years of public school teaching. Encouraged by her “fiddler” Grandpa Premer, she started out playing violin but converted to viola during 7th grade in District 66, Omaha, and became a charter member of the Omaha Youth Orchestra conducted by Joseph Levine. In 1962, she was awarded an AF of M scholarship to the Congress of Strings where her teacher was William Lincer (principal violist of the New York Philharmonic) and conductors included Eric Leinsdorf (Boston Symphony), Michel Piastro (Longinnes Symphonette), Joseph Krips (Buffalo Philharmonic) and Robert Shaw (Atlanta Symphony). During her senior year of high school she played with her teacher Dave Majors in the viola section of the Lincoln Symphony conducted by Leo Kopp. After graduating from Westside, she majored in Music Education at Drake University and played in the Des Moines Symphony conducted by Frank Noyes. She became a string teacher in District 66 and played in the Omaha Symphony conducted by Joseph Levine. In 1968, she received a Rockefeller Foundation Scholarship to participate in the summer Teacher’s Performance Institute Orchestra at Oberlin College with conductor George Trautwein and where she met her future husband, principal oboist Harvey Jewell. They moved to Seattle for graduate study at the University of Washington where she received her Master’s degree, studied viola with Donald McGinnis, and played in the University Symphony conducted by Stanley Chapple. She taught strings in the Kirkland School District. A series of moves then took the Jewells to Cornell College, Iowa, where she played in the Cedar Rapids Symphony conducted by Richard Williams and was principal viola of the Cornell Orchestra conducted by her husband, and then to Great Falls, Montana, where she taught strings and was principal viola for the Great Falls Symphony. Two children — Melody and Eric arrived during their five year tenure in Montana and then it was moving time again to Dallas, Texas, where she played in the Greater Dallas Community Chamber Orchestra, founded and conducted by her husband. Then it was a few years in Oklahoma where she played viola in the Lawton Philharmonic conducted by Jack Bowman and played for her husband’s Broadway shows at the University of Science and Arts. Next came Chicago where she played in the Oak Park Symphony conducted by Perry Crafton, and various ensembles with her husband at the American Conservatory of Music. She also taught strings in Oak Park and Itasca schools. Jewell’s career as a violist now spans more than 50 years and includes performances with notable musicians of her generation. Among her favorite memories are concerts in Omaha with guest conductors Howard Hanson and Roger Wagner; soloists Sherrill Milnes and Janos Starker; Phyllis Diller in Cedar Rapids; Henry Charles Smith conducting Stravinsky’s “Rite of Spring”; Yo Yo Ma with the SDSO for Washington Pavilion’s opening season; David Gier’s ventures into contemporary repertoire and Mahler masterworks; and Verdi’s “Requiem” and Mozart’s “Marriage of Figaro” in Great Falls with her husband conducting. Jewell continues to teach private students and performs with the SNO chamber string ensemble, Augustana College/Community Orchestra and for church groups on special occasions.